Sarah Bernhardt, known as the “divine Sarah,” was widely considered the most significant French actress of the nineteenth century. Bernhardt débuted at the Comédie Française in 1862, where she became well known for her performance as Cordelia in King Lear. She performed in numerous London and American theaters, after tremendous success in her first role abroad as Racine in Phèdre. In addition to starring in plays internationally, Bernhardt was a painter, poet, sculptor, playwright, and theater manager. N. Sarony. 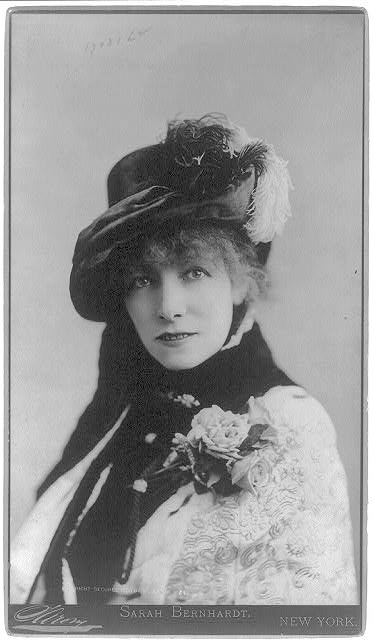 Sarah Bernhardt, 1880. Library of Congress, Prints and Photographs Division, Washington, D.C.